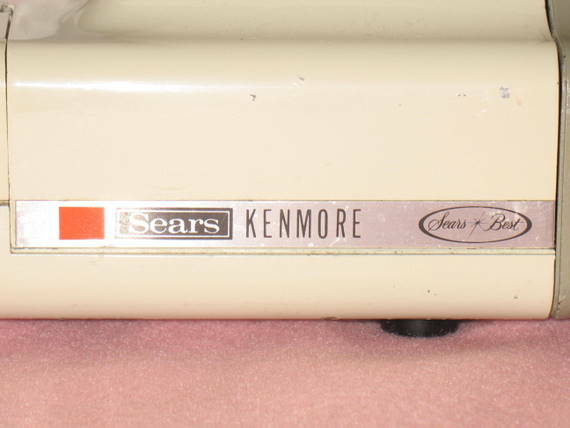 The Sears Kenmore 1040 (Model 158.10401) is another very sturdy, well-built sewing machine. 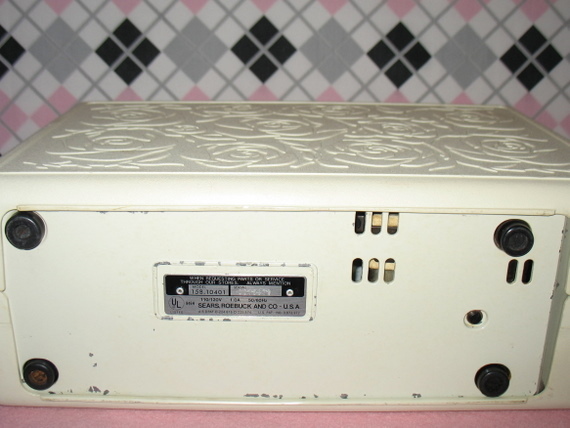 The 1040’s were built in Japan between 1971-76, per the model number on this one, it dates to 1973. 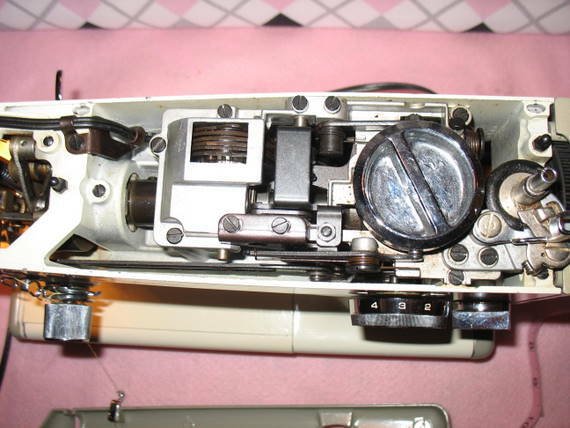 This sewing machine is an all-metal gear driven mechanical sewing machine. If you are diligent about cleaning and oiling it, you will avoid many trips to your local Vac and Sew. 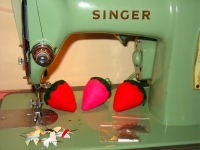 Singer Featherweights are great for taking to a class or quilting club. 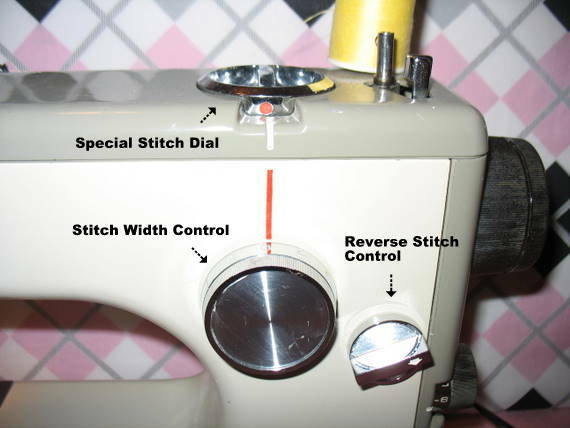 However, if you are taking a clothing sewing class you may need different stitches like the zig zag stitch or you may need to make a buttonhole – this is the machine to take. 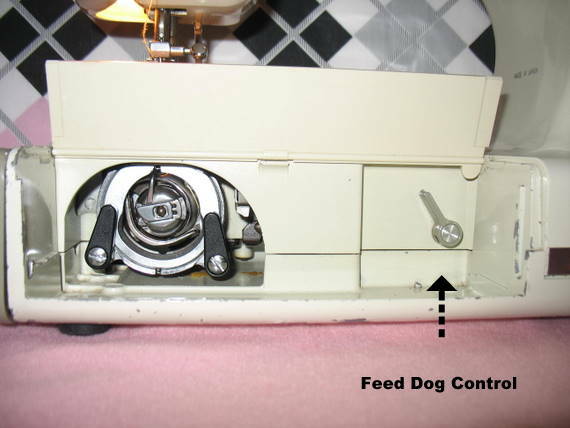 The feed dogs on this machine can be dropped for free-motion sewing or drawing, and darning. 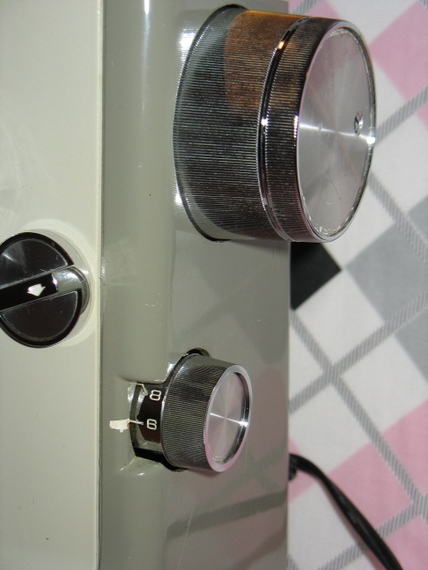 It has the very useful reverse stitch knob. It uses regular Class 15 bobbins and Standard 15×1 needles (sizes 9 – 18). The 1040 can do double needle stitching as well. 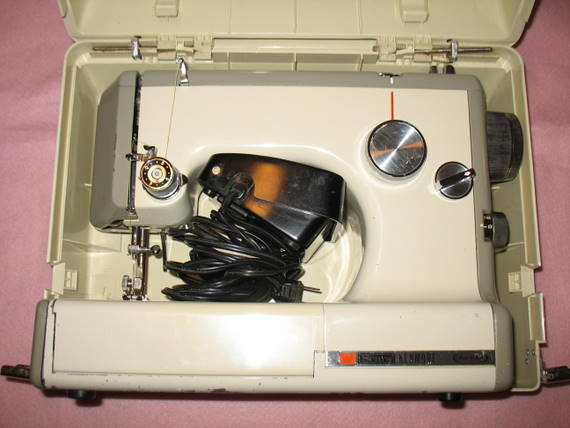 Although you cannot see it in the photos because the motor is inside, the Kenmore 1040 has a 1.0 amp motor which can handle sewing on vinyl as long as you have the proper foot attached. 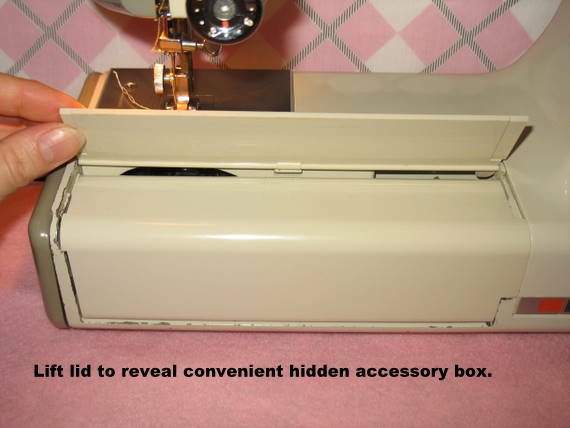 Another nice little feature this machine has is a hinged extension for added sewing space. 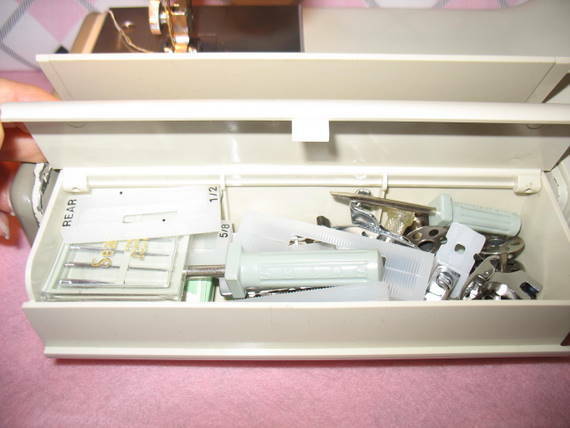 For more sewing space, the accessory box can be turned out towards you also. The accessory box is a nice and convenient addition to this machine, especially when traveling with it as all the machines feet, bobbins, etc. fit in this little box. 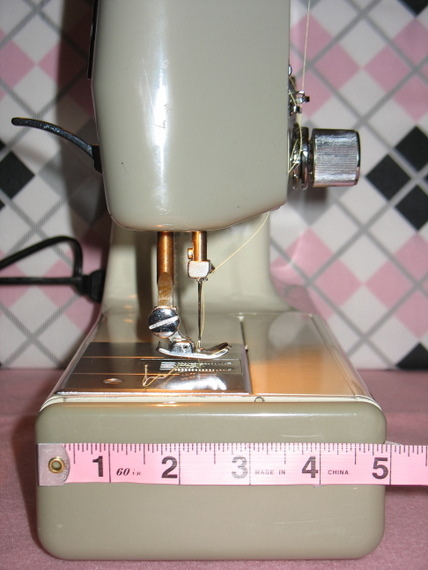 Some of the original accessories include a zigzag foot, straight stitch foot, satin stitch foot, zipper foot, blindstitch guide with shank, buttonhole guide feet and 2 small screwdrivers. You can also use snap-on feet with an adapter. 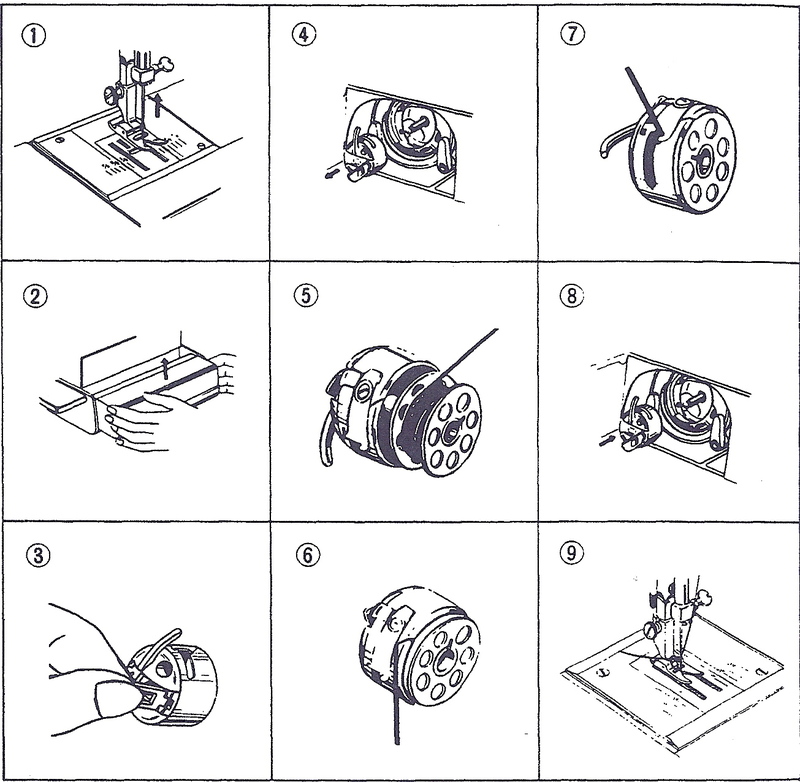 Here are a couple of photos showing the threading diagrams for the upper thread and bobbin. 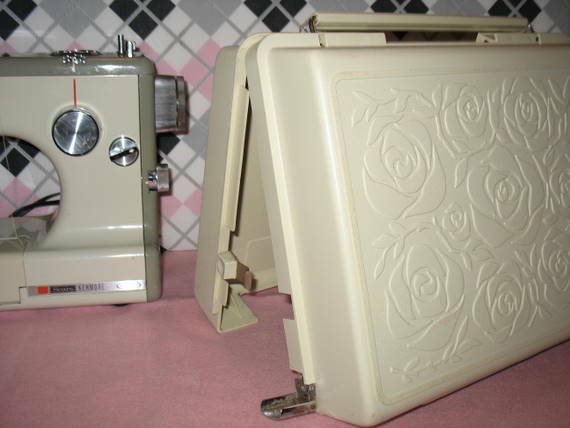 If you are lucky, you will find the Kenmore 1040 complete with its off-white clamshell Rose Embossed Carrying Case. 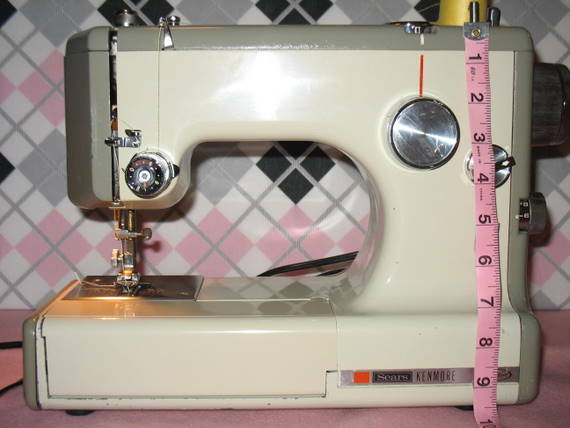 Overall this is a great little machine, it is sturdy, well made, and has the minimum of features and stitches that any sewist would need and want. 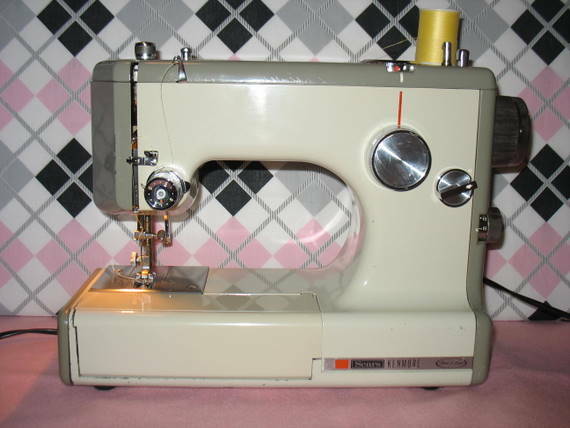 You can still order some parts for this little sewing machine at Sears Parts Direct. This machine did not come with any accessories when I purchased it, however when I ordered the accessories from Sears, they sent me all of them including a brand new accessory box. This was great as the box the machine came with had become yellow as many old plastic pieces on sewing machines do. 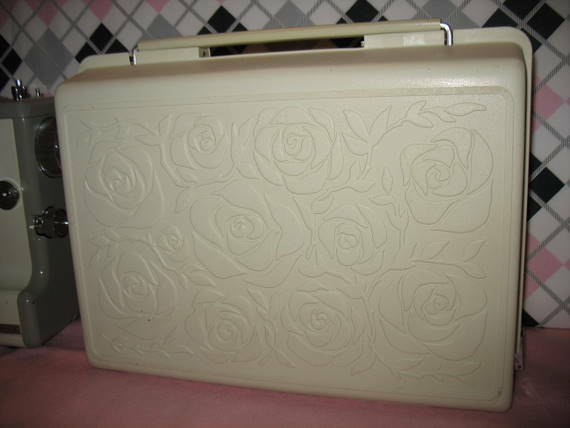 I inherited one of these from my aunt a couple of years ago when she died. 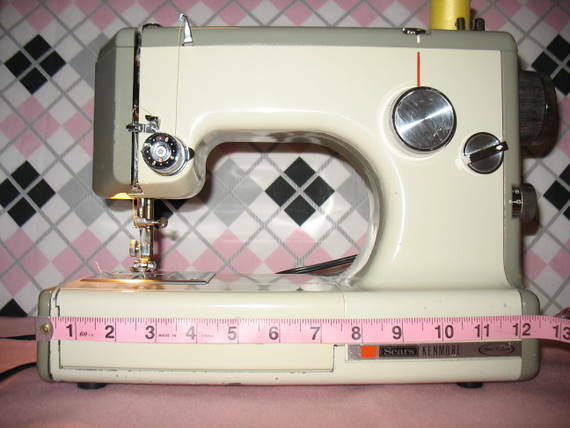 The machine was one of only a couple “mementos” of her that I chose, because it struck me as being the sewing machine equivalent of her: serious, tough, utilitarian, yet talented and capable without having any “frilly-dilly” features to weigh it down and muck up her efficient stride. As I’ve begun to use it a bit, I’m seeing that, also like my aunt, there’s more to this than first meets the eye, and I mean that in a good way! I have no training and I’m very much a novice discoverer/experimental sewer–as in “wonder what THIS does….oh” and “Wonder if I can make a quilt/purse/shirt/etc……sew sew rip re-sew….well, yeah. The next one I make will probably turn out better….” I just discovered the hinged extension a couple of nights ago after using the machine for several hours. Didn’t know about the feed dog lever at all until I read your review and I’m guessing that those mysterious little slotted plastic thingies are buttonhole guide feet (now that I know what they are, I can start learning about what you do with them). I’m really enjoying getting to know this little machine! I imagine my aunt is glad to know it’s being appreciated too. She obviously took excellent care of it, as it runs like a dream! I just found a Kenmore 1050 yesterday at GW. It needed some serious help, but I won! Thank God for oil pens and husbands too. He helped when I ran out of ideas. Together we got it running SWEET! Those little Kennies are so cute and such sturdy little machines! Lucky you! Thanks – I learned quite a bit from your post. I picked one of these up quite cheap a few years ago at a yard sale. Lucky me! I took it camping that summer – easy because of it’s size – and my niece and I were sewing with it. Her curiosity asked what the lever was – and I soon found out it lowered the feed dogs. Very nice indeed. I took a bobbin work class at our state quilt show this summer and everyone had their nice new Husquvarana’s, Bernina’s and the like. I brought this – and they all thought I was crazy. The instructor asked if I could do free motion! I said – yep – all set. I think I amazed quite a few of the other students and the instructor with that old little machine! Need to find a light bulb and manual for it though if possible. I’ll try Sears Parts Direct. Yes, mine came with the clamshell case. Thanks again. Thank you for your offer but I already have a copy of a manual. It is just that I would love to find an “original” manual for my machine. Lucky you and good for your mom that she is still sewing! I buy the same machine for just $6.00 because i founded cute, in a really good conditions. And I did know nothing about the machine till now. And I really like it. The machine have everything that you show in the pictures. Thanks for the information I appreciate. This was so full of information. My husband has his mom’s just like this one. I am going to clean it up and give it to my 8 yr. old granddaughter because she has become interested in sewing. However I don’t have the manual so I have some questions. 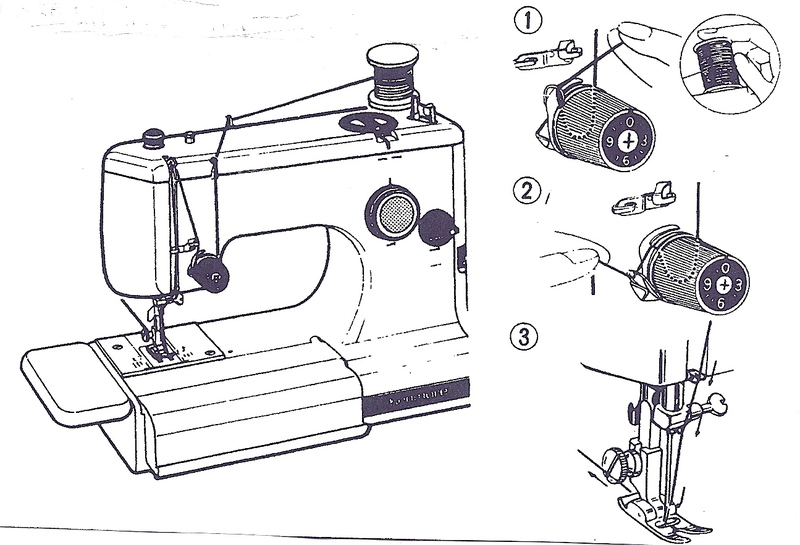 I would like to know the correct way to thread the machine. Also do you know where I could get a manual for it? 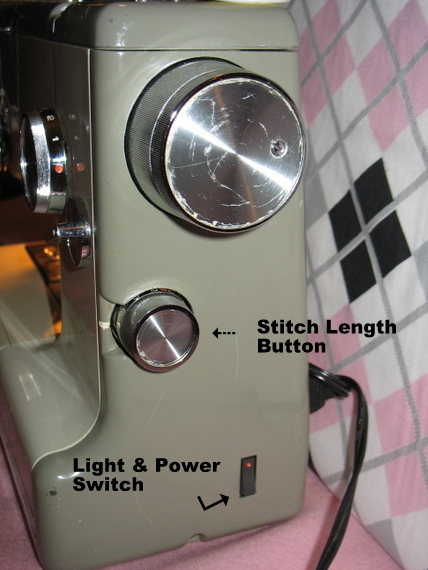 I have updated my review to include threading diagrams for the upper thread and bobbin thread. 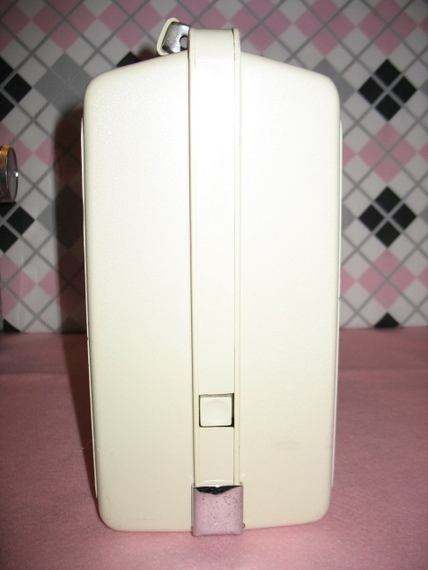 There are many online sellers that you can purchase a copied/pdf manual from however, you can obtain a free manual if you register with the Sears website ManageMyLife at http://www.managemylife.com/. 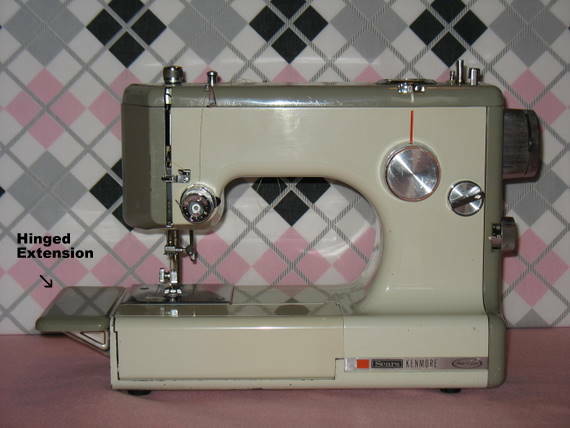 Once you register, you can search for the manual by entering the entire sewing machine model. The manual is a downloadable PDF file of a copy of a manual. Original manuals are very difficult to find. Sonia, thank you so much for your help. I will try threading it according to the manual and see what happens. I will let you know what happens. That was very nice of you to send me the info I needed. I just found one 158-1040 but it has no accessory box and no accessories. Your comment that these are (hopefully still???) available at Sears Parts gives me hope. I was not going to pick it up but now I might just do so. Any other thoughts? YOur post is extremely helpful. Actually the one I found is a model 158 1784080. Got my numbers mixed up. Any comments on that? 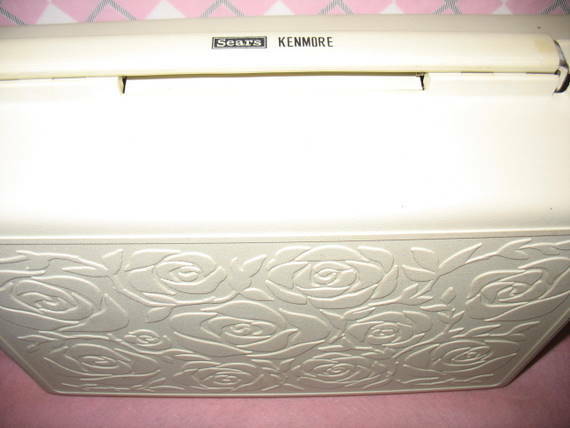 I am not familiar with this specific sewing machine (Kenmore 158.1784080) but in my opinion and experience, old Kenmore sewing machines are great and durable. It appears that Sears currently does not stock the accessory box with accessories, nor the accessory box which is the extension table of the machine. It may be a bit difficult to find the original items that came with the machine when it was first sold, but you may find some of the accessories online. 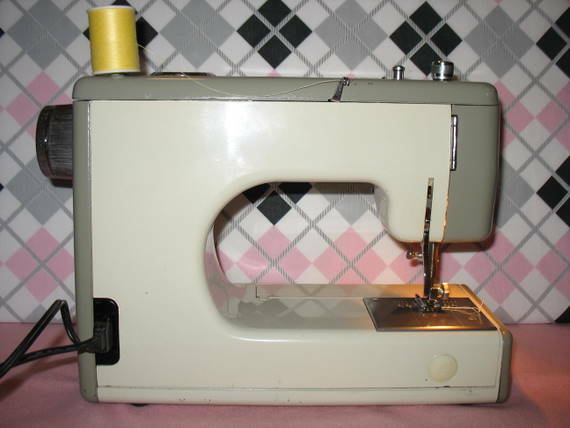 This sewing machine appears to be a low shank machine so if you have other low shank sewing machines their feet and accessories can be interchangeable. Thanks so much. You are correct that sears no longer has accessories, but I used that to knock the price down and am going to see if it sews OK for my immediate needs. Thanks so much for your feedback – I really appreciate it and you have been helpful. I have a similar machine like this but it is made by Jaguar. It is red-brown instead of cream on the top cover. I have noticed that the gear driven by the motor on the right side was made of plastic and I am not sure if this will last or can stand a hard fabric without breaking it. Thanks for your great effort! I just got my second kenmore,; the first one was post 1040 which I just brought home today – I’ looking forward to playing with my new toy.